Reference Data for Engineers is the most respected, reliable, and indispensable reference tool for technical professionals around the globe. Written by professionals for professionals, this book is a complete reference for engineers, covering a broad range of topics. It is the combined effort of 96 engineers, scientists, educators, and other recognized specialists in the fields of electronics, radio, computer, and communications technology. 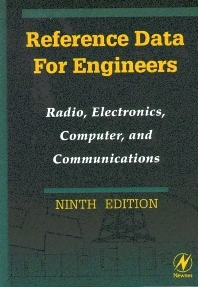 By providing an abundance of information on essential, need-to-know topics without heavy emphasis on complicated mathematics, Reference Data for Engineers is an absolute "must-have" for every engineer who requires comprehensive electrical, electronics, and communications data at his or her fingertips. Featured in the Ninth Edition is updated coverage on intellectual property and patents, probability and design, antennas, power electronics, rectifiers, power supplies, and properties of materials. Useful information on units, constants and conversion factors, active filter design, antennas, integrated circuits, surface acoustic wave design, and digital signal processing is also included. The Ninth Edition also offers new knowledge in the fields of satellite technology, space communication, microwave science, telecommunication, global positioning systems, frequency data, and radar. Widely acclaimed as the most practical reference ever published for a wide range of electronics and computer professionals, from technicians through post-graduate engineers. Provides a great way to learn or review the basics of various technologies, with a minimum of tables, equations, and other heavy math. Wendy M. Middleton is an independent editor, project manager and consultant for technical publications. She has a life long passion for science in general, and space ship engineering in particular. She recently served as editor for Green Electronics, Green Bottom Line, by Lee Goldberg (Newnes, 2000). Mac E. Van Valkenburg (Ph.D., Stanford University, 1952) was Grainger Professor of Electrical Engineering at the University of Illinois from 1982 until his retirement in 1988. He was a member of the Dean's Advisory Board at Purdue University, the Advisory Board at the University of California at Santa Barbara, and the Board of Directors of Engineering Information, Inc. In addition to serving as Vice President for IEEE publication activities in 1970 and 1971, Dr. Van Valkenburg was editor of the Proceedings of the IEEE and the IEEE Transactions on Circuit Theory, as well as editor-in-chief of the IEEE Press. Of the many distinguished books he has written, his first, Network Analysis, sold nearly a million copies.